Hong Kong’s MTR Corporation has announced that it has entered into an Entrustment Agreement with the HKSAR Government for the construction of the main works and commissioning of the 17km long, US$4.6bn Shatin to Central Link (SCL). The line is split into two phases between Tai Wai in the north and Admiralty on Hong Kong Island. 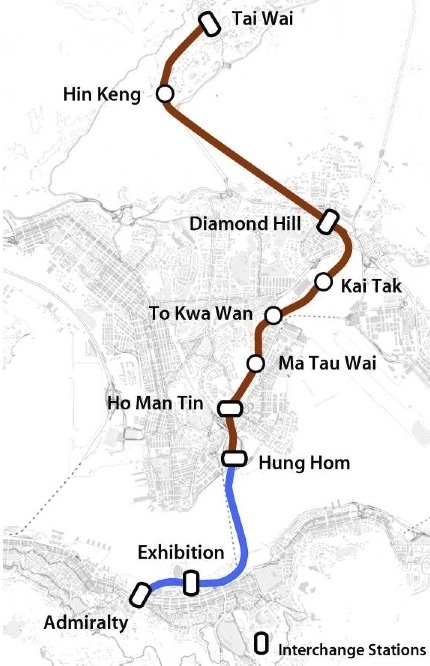 Phase 1 runs for 11km, 10.6km of which is underground between Tai Wai and Hung Hom Stations, whilst the 6km long entirely underground Phase 2 continues the line from Hung Hom to Admiralty with a 2km crossing of Victoria Harbour. SCL consists of 10 stations, 6 of which are interchange stations, namely Tai Wai, Diamond Hill, Ho Man Tin, Hung Hom, Exhibition and Admiralty. The Phase 1 section between Tai Wai and Hung Hom is scheduled for completion in 2018 and the Phase 2 Hung Hom to Admiralty Section in 2020.